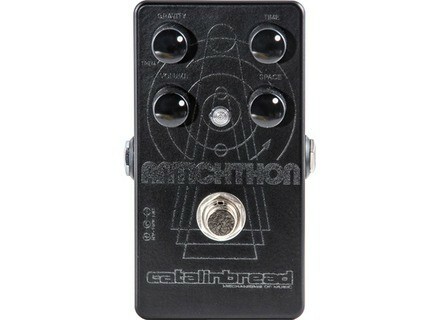 Antichthon, Fuzz pedal from Catalinbread. The Talisman stompbox is a plate reverb effect inspired by the famous EMT 140 from the 60s and 70s, that Catalinbread had the opportunity to explore at the Jackpot Studios in order to reproduce all its subtleties in a compact pedal. The Talisman features a high-pass filter, a pre-delay (approximately 100 ms) as well as time, mix and volume controls. 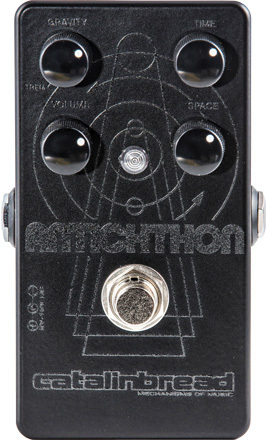 The Antichton is fuzz/tremolo effect that react to the input signal to create three types of effects: « fuzzolo » (dynamic tremolo fuzz) which speed and sound vary according to the volume of your guitar (you’ll have to play with the volume knob) ; dynamic sound generation for results as diverses as weird, when playing with the guitar volume knob and the pedal controls ; and a harmonic fuzz/overdrive. The pedal includes time, volume, space and gravity knobs as well as a bypass footswitch. New Epiphone Acoustic Month If you purchase in March an Epiphone acoustic or acoustic-electric guitar at authorized retailer, you’ll receive a free Shadow soundhole tuner.